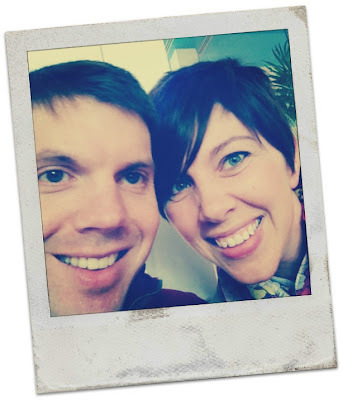 I mentioned in Sunday's post that my husband and I have been making a more concerted effort to make sure we get out on dates. For us, that's a really easy thing to let go. I always take care of my kids' needs, my church responsibilities, the blog, and everything else. However, if something is going to slip it's often some good alone time with him. So we're trying hard to fix that....and it's been really, really fun. A few weeks ago we started brainstorming dates ideas. If we don't have a plan, then we end up not going out. 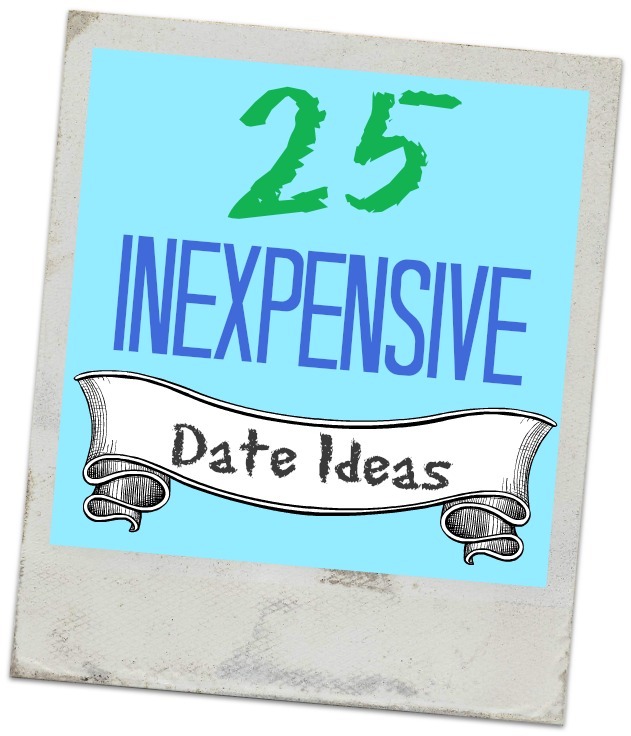 So here are 25 dates ideas we rounded up that I thought you guys might like too. Most of them are pretty inexpensive. 1) Go for a long, scenic drive. 2) Visit garage sales or thrift shops together. 3) Visit an animal shelter and walk the dogs. 4) Go to the driving range and see who can hit the golf balls the furthest. 5) Go for a bike ride. 6) Visit a nursing home and hand out flowers to the residents. 8) Take a trip to the hobby store. Pick out a project to work on for the afternoon. 9) Take a walk – around a lake, in the moonlight, by the river, on the beach. 11) Attend a farmer’s market. 12) Attend a free outdoor concert or movie. 13) Go to a playground. Play on the equipment and talk about your childhood. 15) Have a progressive potluck dinner. Plan this with a few couples - eating a different course at each home. 16) Have a photoshoot. Practice your photography skills on each other. 17) Plan a scavenger hunt for him. 18) Buy a travel book about your dream destination and read it together. 19) Go on a factory tour. 20) Go on a morning date. Pick up breakfast. 21) Decorate mugs for each other. Buy them at the dollar store and purchase a porcelain pen at a craft store to decorate them. 22) Memory Lane. Revisit a place that has special meaning for the two of you. 23) Wake up early and watch the sunrise. 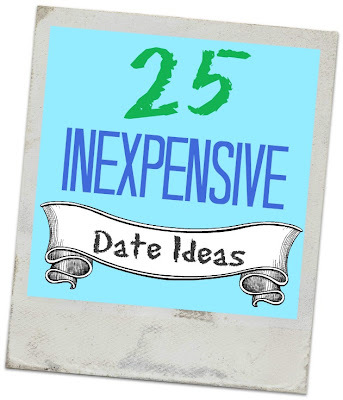 24) Repeat your first date as closely as possible. 25) Have a coupon date. Only do things you have a coupon for. Got anything to add to the list? We'd love to hear some suggestions. Anyway we always try out a new restaurant and then do an activity. Mini golf, bowling, shopping, etc. One weekend my mom came in town so we had an overnight date night - we went to a hotel about 20 mins away and spent the night. We just snuggled in bed and watched movies and talked and then we slept in - it really was the best date ever!!!! We've been really bad at dates lately---well since my almost 1 year old was born. We try to go about once a month, but plan something fun for Friday nights that we do as a family. Mostly it's a bite to eat and go to Lowe's or another man store, but it's time with my husband and it works. We also do lots and lots of coupons, and can sometimes get really good deals! We just got the pass of all passes. They have so many great activities on there that you can do with a family, or just with the spouse. I got them off of a deal site, so they were super cheap. Sometimes we like to hit up Barnes & Noble, look around at books, read some of whatever we are reading at the time and grab a piece of cheesecake or hot chocolate (or I like their steamers). We've been working on doing Date Night ourselves. How about go to the library for yourselves and check out some books, play a game of tennis, shoot some hoops, croquet (sports in general), or date in-invite some couples over to have a game night. Right now we swap with another couple and watch each others kids. That helps with the cost too. Have fun!!! What a fun list of ideas! Thanks for the reminder! It's so hard to get out sometimes and then if we do get out, it's hard to figure out what to do that doesn't cost a fortune! Thank you! If there is a botanic garden or arboretum nearby, visit together and enjoy nature. If it is a drive away, it can be a sort of road trip. Pack a lunch or buy some sandwiches to enjoy while there. Being surrounded by nature on a lovely day is a great way to reconnect. Enjoy!